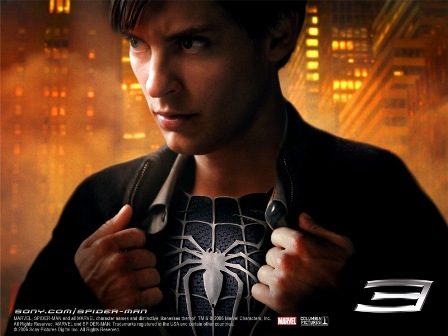 Sony Pictures has released a series of Spiderman3 wallpapers for PC, PSP and mobile phone. Among the wallpapers, one of it features the Venom, the arch-enemy of Spider-Man and a Marvel Comics supervillain and anti-hero, who born as a result of symbiosis between an alien life-form known as symbiote and and a living, biological host Eddie Brock, a former Daily Globe reports. 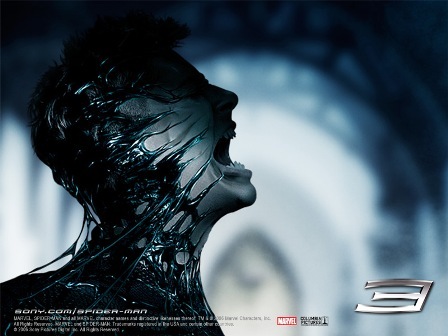 In Spider-Man3, Venom (Eddie Brock Jr) is acted by Topher Grace. Also revealed in the Spider Man 3 wallpapers are Spiderman in black suite costume. In comic book series, Spider-Man was bonding to the sentient alien symbiote which depicting as black liquid when he was searching for new costume suite after daming his blue-and-red costume in combat in alien plant, at Secret Wars series. Symbiote covers Spider Man body, and forms a new black suite for Spider-man. The last of the wallpapers released can be found here, most likely also the Spider-Man in black suite, together with the Spiderman3 teaser trailer. This entry was posted on Thursday, October 5th, 2006 at 8:49 pm	and is filed under Movie Trailer. You can leave a response, or trackback from your own site. One Response to "Spider-Man 3 Villain Venom and Spiderman Black Suit Design Preview from Wallpapers"